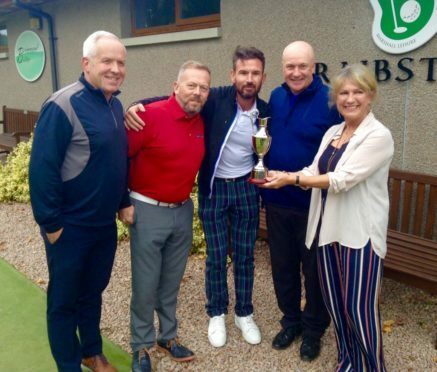 DREAM TEAM: Neale Cooper’s sister, Shirley Blake, presents the trophy to winning team Tenaris Global Services, who are Graham Watson, Mike Halliday, Darren Chilton and Mike Ritchie. The Aberdeen FC Former Players Association has established the Neale Cooper Memorial Trophy – also known as the Tattie Trophy in reference to his nickname – to pay tribute to the celebrated Gothenburg Great, who died aged 54 at the end of May. The prize will now be awarded to the winning team at the association’s annual golf outing, which Mr Cooper had competed in almost every year since it was eastablished in 2003. The first winners of the Tattie Trophy were Mike Ritchie, Darren Chilton, Mike Halliday and Graham Wilson, who secured it at a recent tournament at Craibstone Golf Course. They were handed the award by Mr Cooper’s sister Shirley Blake. Former Dons striker and former players association committee member Walker McCall said: “It was strange having our golf outing without Neale, he was always the life and soul of the whole day. “He was a good friend to all of us, and it hardly needs to be said that we really missed having him about. “The minute you stepped into a room you knew it was there because all you would hear was laughter as everyone enjoyed his unique way of sharing stories from his time as a player. “It was an absolute privilege to be in his presence.